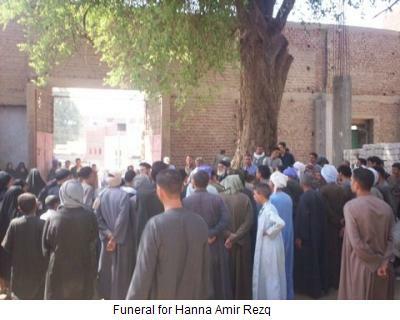 Egypt (AINA) -- Nayer Mansour Sahrab, a Muslim minibus driver, stabbed four Christian Copts on Sunday, September 27, in the village of Delga, Deir Mawas, Al Minya Governorate, killing one and seriously injuring the other three. The incident led thousands of angry Copts to rally and demand an end to the government's policy of indifference in dealing with Coptic issues. State Security forces have cordoned the village and are still heavily present near the church. When a Coptic family desired to board a minibus other than the one owned by Mr. Sahrab (28) an argument ensued. Mr. Sahrab was apparently "offended" that his services were declined. 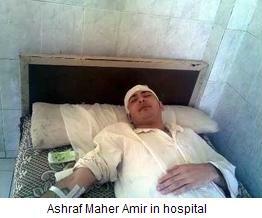 The Copts were beaten by Mr. Sahrab, his brother and other Muslims. Mr. Sahrab stabbed Hanna Amir Rezq (26) in his back and abdomen several times with a knife, as well as his brothers Maurice and Amin and his 20-year old nephew Ashraf Maher Amir, who was stabbed several times in the head. Mr. Sahrab fled after committing the crime, but was later arrested. 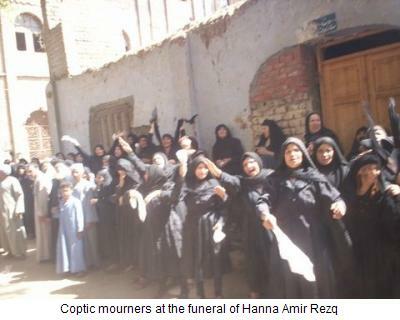 The killing caused thousands of Copts to rally in front of Deir Mawas Hospital, where Hanna Amir Rezq was taken together with the other three wounded Copts. Hanna died shortly after his arrival. According Mariam Ragy, correspondent for the Middle East Christian Association (MECA), State security prevented Copts from going into the hospital to check on the status of the injured and dispersed them by force. 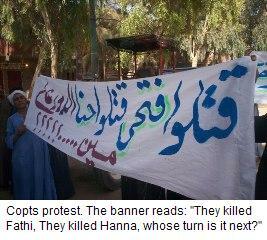 "Angry Copts also rallied in the village of Delga holding banners demanding a stop to Coptic persecution," she said. Reverend Abram, pastor of the village Saint Abram Church told the Egyptian Daily Masry el Youm that this is not just a fight between a Muslim and a Christian, "Copts are targeted and this is the second incident within one month that a Copt is killed during a fight with a Muslim. The first Coptic victim was murdered after an argument over planting some palm trees, and the second victim today was murdered over boarding a minibus." His Grace Aghapius, Bishop the Holy Diocese of Deir Mawas and Delga, described the village of Delga, which lies 350 km from Cairo, as "the most violent and the least safe," giving the example of the village Muslims attacking the Copts as they entered the village church for the funeral service of the victim Hanna and on their way out to bury him. "They were pelting them with stones, cheering and singing accompanied by drum beats and Muslim women were letting out the traditional celebration sound. All this happened in the presence of security," he told Mariam Ragy. Eyewitnesses reported that Copts were replying to Muslims chant of "Allah is Great" with "With our soul and our blood, we will defend our Cross." Bishop Aghapius said that Copts were also assaulted after the burial, with Muslims smashing Coptic-owned cars, as well as attacking streets that are inhabited entirely by Copts, including El-Hamr Street, prompting Coptic inhabitants to remain inside their homes. "How could all this happen in the presence of seven State Security cars in the village, adjacent to the church?" he asks. "I am still waiting for State Security to carry out their promises of solving our problems." Hegomen Selwanes of Deir Mawas Diocese told Wagih Yacoub, activist with MECA that this is the second killing of a Copt by a Muslim within one month. The first killing was Fathi Gayed leading to the arrest of numerous Muslims, but prosecution seeks to implicate a 12-year-old boy, which would let the real killer get off the hook. "This incident and similar ones has encouraged Muslims that they can get away without punishment by killing a Copt. This has led Copts to protest. We cannot accept that every few days a Copt gets killed." He also said that top Coptic attorney, Dr. Ihab Ramzy, will handle the case. "The government has to carry out an awareness campaign that the Copt is a citizen and has rights equal to the Muslim. They do not respect us." He also added that the Copts in Delga, who are nearly 30,000 out of a population of 100,000 inhabitants, are very peaceful citizens and are always on good terms with their Muslim neighbors. "Copts are targeted because they are meek and unable to defend for themselves," Reverend Abram told Coptic News Bulletin. "Besides, Muslims know very well that they will never be prosecuted for killing a Copt.". He explained that they would not dare do the same things to a Muslim, because they would get killed. "Unfortunately Coptic blood is cheap. We demand fairness and equal application of the law, for homicides committed against Copts."